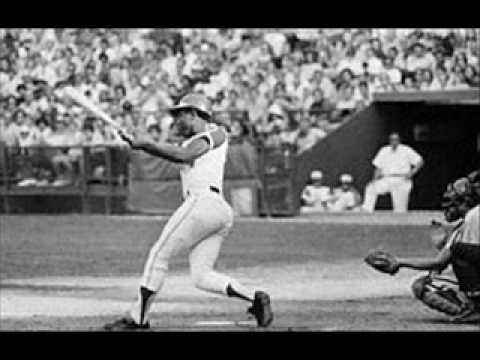 As the 1974 season began, Aaron's pursuit of the record caused a small controversy. The Braves opened the season on the road in Cincinnati with a three-game series against the Cincinnati Reds. Braves management wanted him to break the record in Atlanta, and were therefore going to have Aaron sit out the first three games of the season. But Baseball Commissioner Bowie Kuhn ruled that he had to play two games in the first series. He played two out of three, tying Babe Ruth's record in his very first at bat off Reds pitcher Jack Billingham, but did not hit another home run in the series. 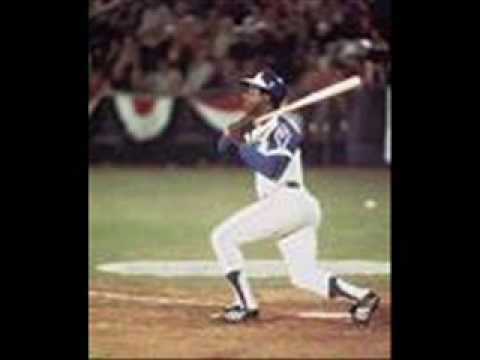 The fence over which Hank Aaron hit his 715th career home run still exists outside of Turner Field. 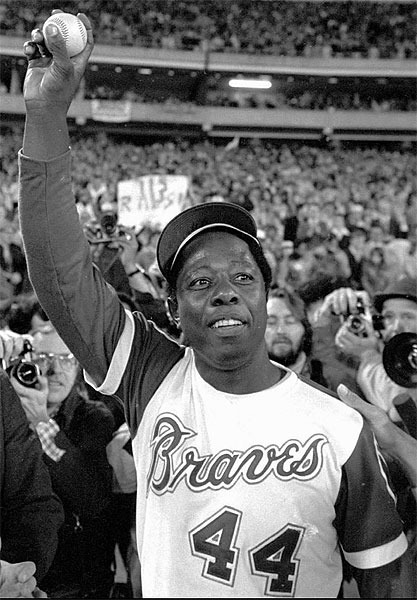 The team returned to Atlanta, and on April 8, 1974, a crowd of 53,775 people showed up for the game — a Braves attendance record. In the fourth inning, Aaron hit career home run number 715 off Los Angeles Dodgers pitcher Al Downing. Although Dodgers outfielder Bill Buckner nearly went over the outfield wall trying to catch it, the ball landed in the Braves' bullpen, where relief pitcher Tom House caught it. While cannons were fired in celebration, two white college students sprinted onto the field and jogged alongside Aaron for part of his circuit around the bases, temporarily startling him. As the fans cheered wildly, Aaron's mother ran onto the field as well. Henry Aaron's ordeal ended at 9:07 p.m. Monday. It ended in a carnival atmosphere that would have been more congenial to the man he surpassed as baseball's alltime home-run champion. But it ended. And for that, as Aaron advised the 53,775 Atlanta fans who came to enshrine him in the game's pantheon, "Thank God." Aaron's 715th home run came in the fourth inning of the Braves' home opener with Los Angeles, off the Dodgers' Al Downing, a lefthander who had insisted doggedly before the game that for him this night, would be "no different from any other." He was wrong, for now he joins a company of victims that includes Tom Zachary (Babe Ruth's 60th home run in 1927), Tracy Stallard (Roger Maris' 61st in 1961), and Guy Bush (Ruth's 714th in 1935). They are destined to ride in tandem through history with their assailants.